On June 30, 1865, the New Hampshire Legislature authorized the Governor, “to appoint two Commissioners to consider the subject of the restoration of sea fish to our waters and the introduction of new varieties of fresh water fish.” What we know today as the NH Fish and Game Department began as a Commission of Fisheries. In 1880 the Commission was reorganized as a “Commission of Fisheries and Game” and was given the authority to enforce game laws. Every city and town in the state was mandated to hire their own Game Wardens or face a $50.00 fine. 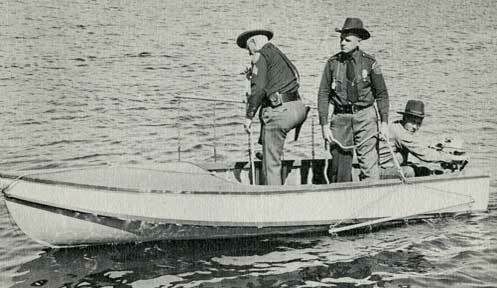 After the Legislative Session of 1914-1915, Special Fish and Game Detectives became State Game Wardens. Their salary was not to exceed $100 per month plus their necessary expenses when continuously employed, and three dollars per day when not continuously employed for more than two weeks. There were seven State Game Wardens in 1915. Handicapped as it was by inadequate funding, enforcement under a centralized agency was, from the start, an improvement over earlier systems. Violators were apprehended and punished, a rare accomplishment under local administration. Much of the credit for the Department’s early success was due to the cooperation of sportsman’s clubs and a dawning public appreciation of conservation. The law limiting the number of State Game Wardens to ten was repealed in 1925 and in 1926 the warden force was nearly doubled. The 1926 Biennial Report of the Department of Fisheries and Game reported that the additions to the warden force cut down the average territory covered by each warden from one thousand square miles to about five hundred square miles. Within four years, automobiles and outboard motors were purchased, greatly increasing the efficiency of the wardens. In 1934-35, reorganization raised the standards of the force and resulted in more careful screening. State Game Wardens were now officially called Conservation Officers (CO’s) and worked under the NH Fish and Game Department. 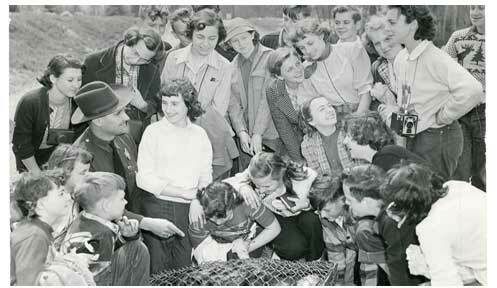 The scope of their duties included many activities beyond enforcement; they assisted research and hatchery personnel, checked game and fish, maintained feeding stations for game and songbirds, conducted searches for lost persons and suppression of forest fires, represented the Department at sporting meetings, and inspected wildlife breeding farms. Conservation Officers now also instruct hunter safety programs and other outdoor education programs. There were 26 Conservation Officers in 1935. This complement of officers cut down the average area covered by each officer to 384 square miles. Additional Conservation Officers were added as World War II ended and hunting and fishing license sales increased dramatically. In 1964, Fish and Game provided CO’s state-owned vehicles. This idea was originally started in 1926 but was discontinued until 1964. In the 1960’s, the new outdoor recreational activity of snowmobiling became popular. With its popularity came enforcement issues, as landowners and riders clashed over where snowmobiles were allowed to ride. NH Conservation Officers became the lead law enforcement agency to deal with these problems. In 1967 the registration of snowmobiles became state law as a way to fund the construction and maintenance of trails. Conservation Officer Carl Carlson issued the first summons for an unregistered snowmobile in Pittsburg in 1968. Today’s Conservation Officers spend much of their winter on issued “sleds” patrolling the nearly 7,000 miles of snowmobile trails throughout the state. Just as the 1960’s saw the advent of snowmobiles, the early 1980’s was the beginning of the wheeled vehicle popularity with the 3-wheel All Terrain Vehicle (ATV). Technology and enthusiasm for riding would greatly increase over the years as would the need for law enforcement. Again, CO’s would take the lead for enforcing New Hampshire’s Off Highway Recreational Vehicle (OHRV) laws. In some areas of the state, complaints concerning OHRV’s outnumber all other calls to service. New Hampshire CO’s would reach a milestone in 1972 as the number of officers reached an all-time high of 50. The number of Conservation Officers would fluctuate between 25 and 50 for the next several decades. Even today, with an ever increasing population of both people and wildlife, and the inevitable conflicts that come with those increases, there are only 40 Conservation Officers for the State of New Hampshire. These officers serve a resident population of 1.3 million people, in addition to the seasonal influx of hunters, fishermen, and other outdoor enthusiasts from nearby metropolitan areas such as Massachusetts and New York.